The Chiesa di San Domenico in Castelvetrano in Trapani Province is a masterpiece. 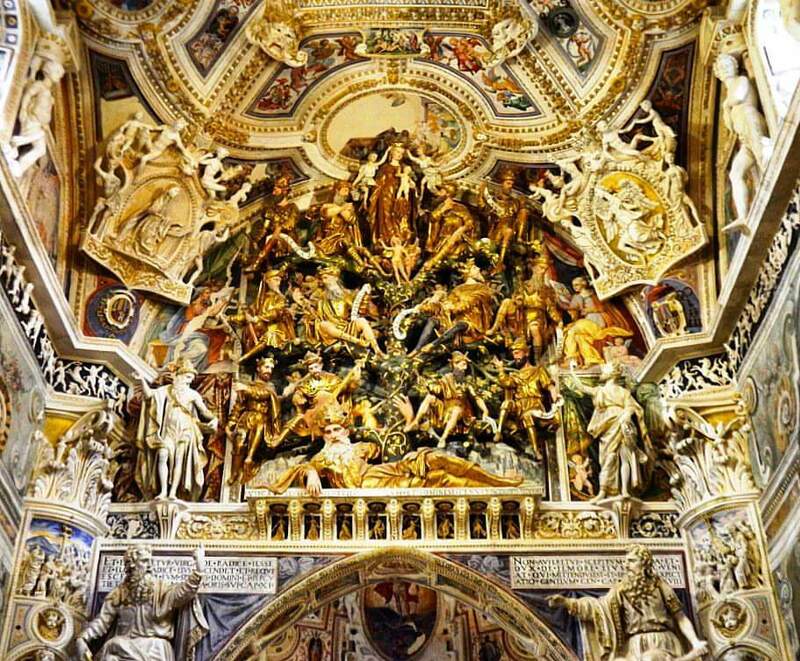 Originally built in the 1470s when commissioned by the Tagliavia family, the church gained spectacle status once artist Antonio Ferraro da Giuliana and his sons spent three years from 1577-1580 creating the stucco scene above the altar titled “Albero di Jesse,” or the Tree of Jesse. Jesse, or Isai, in the Old Testament was the father of King David. The detailed, three-dimensional stucco scene depicts the 12 kings that are Jesse’s successors, leading up to the Madonna–the apex–surrounded by angels. In 1968, the Belice Valley of Sicily, where Castelvetrano is located, suffered a powerful 6.1 magnitude earthquake. As a result, this church, now deemed the “Sistine Chapel of Sicily,” was heavily damaged and closed for safety reasons. It remained shuttered for 40 years! In 2009, the Province of Trapani finally obtained funding to restore it. After five years of work, in February 2014, it reopened to the public with the aim of sharing its decorative details and masterpieces. I must apologize because this photograph simply cannot capture the splendor of this awesome place. This church is something that really needs to be seen in person to fully appreciate the wonder of Ferraro’s creation. This is incredible. Everywhere you look there is some detail to notice. It’s so rich. I can see why viewing it in person would be so much better, so you could see the three-dimensionality. It might even surpass the ceiling of the Sistine Chapel. It’s such a shame that it was inaccessible for 40 years–during the height of tourism!–because it truly is extraordinary.